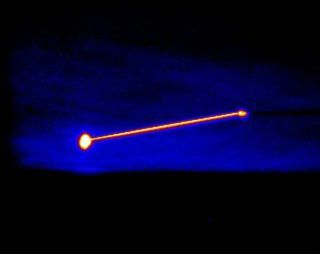 The Missile Defense Agency's (MDA) Airborne Laser Testbed is shown destroying a threat representative of a short-range ballistic missile during a February 2010 test. HUNTSVILLE,Ala. ? The U.S. Missile Defense Agency (MDA)?s flight test thisweek oftheAirborne Laser system was postponed when one of its cooling systemsfailed inpreparation for the test, the agency?s top officialsaid Aug. 18. The AirborneLaser, a modified Boeing 747 aircraft designed to zapballistic missileswith a high-power laser, was being prepared for its third intercepttest atEdwards Air Force Base, Calif., on Tuesday. A commercial-off-the-shelfcoolingsystem for the aircraft?s tracking laser failed, and its replacement isnowbeing installed, Army Lt. Gen. Patrick O'Reilly, the MDA's director,toldreporters at the Space and Missile Defense conference here. The agencyis targeting Aug. 21 for the next attempt, he said. In its firstshoot-down test in February, the aircraft destroyed a boosting soundingrocket.Eightdays later,itreturned to the sky and destroyed its first threat-representativetargetmissile but was then unable to destroy a second target. For theupcoming flight test, the Airborne Laser will attempt to destroyatarget missile from twice the distance of previous tests, MDAofficialshave said. The MDA does not disclose actual standoff distances for theflighttests. BoeingDefense, Space & Security of St. Louis is the Airborne Laserprimecontractor; Northrop Grumman Aerospace Systems of Los Angeles developedthehigh-power chemical laser; and Lockheed Martin developed the beamcontrol/firecontrol system. Thisstory was provided by SpaceNews,dedicated tocovering all aspects of the space industry.